The downing of a Russian military jet by the Turkish military along the border of Syria and Turkey had the two nations offering two very different accounts of what happened. Two astrophysicists have now decided to dig into the stories a little deeper. The two astrophysicists, Tom van Doorsslaere and Giovanni Lapenta of the Belgian KU Leuven, used simple Newtonian mechanics to show how politics plays a more important role than the truth. By using maps that were provided by Turkish and Russian officials, and a video of the incident, they were able to show that the events could have not have happened the way both countries have presented to the public. They wrote their findings on a blog by KU Leuven. The jet was shot down by Turkish military after the pilot was reported to have ignored several warnings about entering Turkish airspace. Turkish officials reported that the military had warned the jets 10 times in a period of five minutes. When the warnings were ignored, the Turkish Prime Minister, Ahmet Davutoğlu, gave the order to fire on the Russian jets. According to Turkish officials, both jet fighters were in Turkish airspace for just 17 seconds. Russian jets had not violated the Turkish airspace. 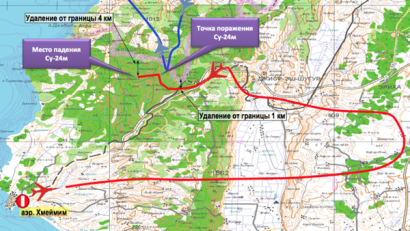 Maps provided by Turkish officials show that the Russian jet had crashed eight kilometers from where it was hit. So this means it had traveled the eight kilometers from the time it was hit to the time it had crashed. Using a simple division it tells us the jet had an initial speed of 609 mph (980 km/h), which is a suitable speed for a jet traveling at that elevation. The physicists then look at the speed the jet was going (609 mph) and compared it to the distance the jet traveled in Turkish airspace, which according to the Turkish map was around 2 kilometers. The Turkish air force claims that it had given 10 warnings to the fighter jets in five minutes. A jet that is traveling 609 m/h would travel a distance of around 50 miles (80 kilometers) in five minutes. The warnings that the Turkish Air Force had given are also under the spotlight, as issuing 10 warnings in just seven seconds seems, on the surface, to be highly improbable. The Russian claims are just as unconvincing, according to the physicists. On the map the Russian officials had given out, it shows that the Russian jets had not violated Turkish airspace. It shows that the jet had made a 90 degree turn when it was struck by the missile. Therefore, a surface-to-air missile could not have caused the jet to change direction, which implies the change was by the pilot’s own maneuvering. So despite Russia’s claims, the jet was likely not actively trying to avoid Turkish territory. “According to our calculations, it is clear that both the story of Turkey and Russia should be taken with a grain of salt. Russia’s claim that the jets avoided Turkey does not correspond to the laws of mechanics,” the physicists concluded.